The Wales national rugby union team (Welsh: Tîm rygbi'r undeb cenedlaethol Cymru) competes annually in the Six Nations Championship with England, France, Ireland, Italy and Scotland. Wales have won the Six Nations and its predecessors 27 times outright. Wales' most recent championship and Grand Slam victory came in 2019. Rugby union took root in Wales in 1850, when Reverend Rowland Williams became Vice-Principal at St David's College, Lampeter, and introduced the sport there. Wales played their first international on 19 February 1881; organised by Newport's Richard Mullock, Wales played against England, losing by seven goals, one drop goal and six tries to nil (82–0, in modern scoring values). On 12 March 1881, the Welsh Rugby Union was formed at The Castle Hotel, Neath. Two years later, the Home Nation Championship – now the Six Nations Championship – was first played and Wales did not register a win. However, rugby in Wales developed and, by the 1890s, the Welsh had developed the four three-quarters formation. This formation – with seven backs and eight forwards, instead of six backs and nine forwards – revolutionised the sport and was eventually adopted almost universally at international and club level. With the "four three-quarter" formation Wales became Home International Champions for the first time in 1893; in the process winning the Triple Crown. Wales next won the Championship in 1900, heralding the first "golden age" of Welsh rugby which was to last until 1911. They won two more Triple Crowns in 1902 and 1905, and were runners up in 1901, 1903 and 1904. When Wales faced New Zealand's All Blacks at Cardiff Arms Park in late 1905 they had not lost at home since 1899. This New Zealand team – now referred to as the Original All Blacks – was the first of the southern hemisphere national teams to visit the British Isles, and were undefeated on their tour up until that point; their victories included prior defeats of England, Ireland and Scotland. [a] Before the match, the All Blacks performed a haka (a Māori posture dance); the 47,000-strong crowd responded with the Welsh national anthem – Hen Wlad Fy Nhadau ("Land of Our Fathers") – the first time a national anthem had been sung before a sporting fixture. Wales' wing Teddy Morgan scored a try to give Wales a 3–0 lead, but later in the match All Black Bob Deans claimed to have scored a try, only to be dragged behind the try-line before the referee arrived. The referee ruled a scrum to Wales and the score did not change; Wales winning 3–0. The loss was the All Blacks' only loss on their 35-match tour. In 1906, Wales again won the Home Championship,[b] and later that year played the South African national side, the Springboks for the first time. Wales were favourites to win the match, but instead South Africa dominated in the forwards and eventually won 11–0. Two years later, on 12 December 1908, Wales played the touring Australians, known as the Wallabies, who they defeated 9–6. In 1909, Wales won the Home Championship and then, in 1910 – with the inclusion of France – the first Five Nations. In 1911, Wales took the first Five Nations Grand Slam by winning all their matches in the Five Nations;[c] France were heavily defeated by Wales at St Helens in 1910 (49–14) and Ivor Morgan scored two tries in the match. It would be nearly 40 years before they achieved a Grand Slam again. England's defeat of Wales at Cardiff in 1913 was Wales' first home loss to one of the Home Nations since 1899, and their first home loss to England since 1895. The Great War came in 1914 and rugby was suspended for the duration. The post-First World War years marked a decline in Welsh rugby. An industrial recession struck the principality, and hurt South Wales in particular. Welsh international results in the 1920s mirrored the performance of the economy: of their 42 matches they won only 17, with three drawn. Half a million people emigrated from Wales to find work elsewhere during the depression; this included many Welsh rugby union internationals who moved to the professional code of rugby league. Between 1923 and 1928, Wales managed only seven victories – five of them against France. However, even France managed to defeat Wales that decade; achieving their first victory over Wales in 1928. Welsh selection policy reflected the upheavals of the mid-1920s. In 1924, 35 different players were selected for Wales' four matches, with a different captain for each; and only Edward Watkins in the backs and Charlie Pugh in the forwards, playing in all four matches. A resurgence of both economy and rugby union followed in the 1930s and, in 1931, Wales won their first championship for nine years. That year, for the first time since the First World War, Wales retained the same side for two consecutive Tests when they faced England and Scotland. Then, in 1933, captained by Watcyn Thomas, Wales defeated England at Twickenham. In 1935, Wales beat the touring All Blacks by 13–12, with Haydn Tanner making his first appearance. Although the Five Nations Championship was suspended during the Second World War[d] Wales did play a Red Cross charity match against England at Cardiff in 1940, which Wales lost 18–9. Following the Second World War, Wales played a New Zealand Army team (the Kiwis) in 1946, which Wales lost 11–3. The Five Nations (suspended during the war) resumed in 1947 when Wales shared the title with England. Although Wales suffered their first home defeat to France in 1948, they won their first Five Nations Grand Slam since 1911 in 1950. The next year, they lost to the touring South Africans 6–3 despite dominating in the line-outs. They achieved another Grand Slam in 1952, followed by a 13–8 win over the All Blacks in 1953. In 1954, St Helens in Swansea (a Welsh international venue since 1882) hosted its last international and Cardiff Arms Park officially became the home of the Welsh team. In 1956, Wales again won the Five Nations, but they did not regain the title until 1964 and did not win it outright until 1965. Wales conducted their first overseas tour in 1964, playing several games and one Test in South Africa. They lost the Test against South Africa in Durban 24–3, their biggest defeat in 40 years. At the WRU annual general meeting that year, the outgoing WRU President D. Ewart Davies declared that "it was evident from the experience of the South African Tour that a much more positive attitude to the game was required in Wales ... Players must be prepared to learn, and indeed re-learn, to the absolute point of mastery, the basic principles of Rugby Union football". This started the coaching revolution. The WRU Coaching Committee – set up in the late 1950s – was given the task of improving the quality of coaching and, in January 1967, Ray Williams was appointed Coaching Organiser. The first national coach, David Nash, was appointed in 1967 to coach Wales for the season, but resigned when the WRU refused to allow him to accompany Wales on their 1968 tour of Argentina. Eventually, the WRU reversed their decision, appointing Clive Rowlands to tour as coach. Of the six matches, Wales won three, drew two and lost one. Wales enjoyed a second "golden age" in the 1970s, with world-class players such as Gareth Edwards, J. P. R. Williams, Gerald Davies, Barry John, and Mervyn Davies, in their side. Wales dominated Northern Hemisphere rugby between 1969 and 1979, and attained an incredible winning record, losing only seven times during that period. Wales toured New Zealand for the first time in 1969, but were defeated in both Tests. As well as losing the first Test 19–0, and the second 33–12, they also conceded 24 points to the All Blacks' fullback Fergie McCormick in the second Test; a record at the time. In 1970, Wales shared the Five Nations with France, and recorded a 6–6 draw against South Africa in Cardiff. The following year Wales recorded their first Five Nations Grand Slam since 1952. Using only 16 players in four games, the 1971 side achieved their most notable win of the tournament in their victory over Scotland; after a last minute try by Gerald Davies that reduced Scotland's lead to 18–17, flanker John Taylor kicked a conversion from the sideline described as "the greatest conversion since St Paul" to give Wales a 19–18 win. Wales contributed more players than any other team to the British and Irish Lions that toured New Zealand that year. Those Lions became the only ones to win a series over the All Blacks. In the 1972 Five Nations Championship, Wales and Scotland refused to travel to Ireland at the height of the Troubles after receiving threats, purportedly from the Irish Republican Army. The Championship remained unresolved with Wales and Ireland unbeaten. Although the Five Nations was a five-way tie in 1973, the Welsh did defeat Australia 24–0 in Cardiff. Wales next won the Five Nations outright in 1975, and in 1976, Wales won their second Grand slam of the decade. Just like the first in 1971, they only used 16 players over their four matches. They repeated the feat in 1978 and, in the process, became the first team to win three consecutive Triple Crowns. Following their final Five Nations match of 1978, both Phil Bennett and Gareth Edwards retired from rugby. Wales hosted the All Blacks at Cardiff Arms Park in November 1978, losing 13–12 after a late penalty goal by the replacement All Black fullback, Brian McKechnie. The penalty was controversial because All Black lock Andy Haden had dived out of a line-out in an attempt to earn a penalty. Haden later admitted that he and Frank Oliver had pre-agreed this tactic should the All Blacks find themselves in difficulties. Referee Roger Quittenton was roasted by the press for failing to notice the dive, but he later stated he had the penalty was in for Welsh lock Geoff Wheel for jumping off the shoulder of Frank Oliver. Quittenton later said, "Haden's perception is that his dive secured the penalty. That is a load of rubbish". The All Blacks went on to secure their first Home Nations Grand Slam. [e] Wales then went on to win the 1979 Five Nations with a Triple Crown. In 1980, the WRU's centenary year, Wales lost to the All Blacks in Cardiff by 23–3 after the All Blacks scored four tries to nil. Wales won two matches in each Five Nations of 1980 and 1981, and in 1983 were nearly upset by Japan; winning 29–24 at Cardiff. In 1984, Australia defeated Wales 28–9 at Cardiff Arms Park and in the process scored a push-over try. Australia went on to win their first Home Nations Grand Slam. Wales achieved only one win in 1987's Five Nations before contesting the inaugural Rugby World Cup. Wales defeated Ireland in their crucial pool fixture, before defeating England in the quarter-finals. They then faced hosts the All Blacks who won 49–6, but beat Australia in the third place play-off game to claim third. The next year Wales won the Triple Crown for the first time since 1979, but heavy defeats on tour to New Zealand later that year saw the end of a number of Welsh players' careers, as several converted to rugby league. Welsh rugby reached a nadir when Wales suffered their first Five Nations championship whitewash; they had upset England in 1989 to avoid losing all their Championship matches that season, but in 1990 Wales were defeated in all four Five Nations' matches for the first time. The 1991 World Cup saw further frustration when Wales were upset by Manu Samoa in their opening match. A second group-stage loss, by 38–3 to Australia, eliminated Wales from the tournament. After winning two Five Nations games in 1992, and one in 1993, Wales won the Championship in 1994 on points difference. But without defeating one of Australia, New Zealand, or South Africa, during the inter-World Cup period, Wales was not considered a major tournament contender. At the 1995 World Cup, after comprehensively beating Japan, Wales lost to New Zealand; this meant that they needed to defeat Ireland to qualify for the quarter-finals. Wales lost 24–23 and so failed to progress beyond the pool stage for the second time, and later that year Kevin Bowring replaced Alex Evans to become Wales' first full-time coach. Record defeats, 51–0 to France, and 96–13 to South Africa, prompted the WRU to appoint New Zealander Graham Henry as coach in 1998. Henry had early success as coach, leading Wales to a ten-match winning streak; this included Wales' first victory over South Africa, by 29–19. Henry was consequently nicknamed "the great redeemer" by the Welsh media and fans. Hosting the 1999 World Cup, Wales qualified for the quarter-finals for the first time since 1987, but lost 9–24 to eventual champions Australia. A lack of success in the Five and Six Nations (Italy joined the tournament in 2000), and especially a number of heavy losses to Ireland, led to Henry's resignation in February 2002; his assistant Steve Hansen took over. During Hansen's tenure, the WRU implemented a significant change in the structure of the game domestically. Regional teams were introduced as a tier above the traditional club-based structures in 2003, and the five (then four) regional sides became the top level of domestic professional rugby in the principality. [f] At the 2003 World Cup, Wales scored four tries in their 53–37 loss to New Zealand, and also lost to the eventual tournament winners, England, in their quarter-final, despite outscoring them by three tries to one. Coached by Mike Ruddock, Wales won their first Grand Slam since 1978 and their first Six Nations Grand Slam in 2005. A late long range penalty from Gavin Henson gave them a victory over England at Cardiff for the first time in 12 years, and after victories over Italy, France, Scotland, they faced Ireland in front of a capacity crowd at the Millennium Stadium where Wales' 32–20 victory gave them their first Championship since 1994. Later that year they suffered a record home loss, 41–3 to New Zealand. Mike Ruddock resigned as the head coach of Wales midway through the 2006 Six Nations, where Wales finished fifth, and Gareth Jenkins was eventually appointed as his replacement. Jenkins led Wales through the 2007 World Cup, where they failed to advance beyond the pool stage following a loss to Fiji. Jenkins subsequently lost his job, and Warren Gatland, a New Zealander, was appointed as his successor. Wales faced England at Twickenham for Gatland's inaugural match as coach and their first match of the 2008 Six Nations. They had not defeated England there since 1988, and went on to win 26–19. They eventually won all their Championship matches, conceding only two tries in the process, to claim another Grand Slam. Later that year Wales defeated Australia 21–18 in Cardiff, but then started a six-year, 23-game winless streak against the southern hemisphere nations of Australia, New Zealand and South Africa. Wales play in red jerseys, white shorts and red socks. For the 2015–16 season, the design of the Jersey incorporated gold for the first time. The jerseys are embroidered with the Prince of Wales's feathers, which were chosen in the 19th century by the WRU over another Welsh symbol, the leek, to demonstrate the nation's loyalty to Britain. In 1991, to enable the device to be trademarked, the original generic motif was replaced with a more stylised version. The original motto beneath the feathers was Ich dien (German for "I serve") but was replaced with "WRU" in the new version. Rugby union and Wales' national team hold an important place in Welsh culture and society. Sport historian John Bale has stated that "rugby is characteristically Welsh", and David Andrew said that "To the popular consciousness, rugby is as Welsh as coal mining, male voice choirs, How Green Was My Valley, Dylan Thomas, and Tom Jones". Welsh rugby's first 'golden age' (1900–1911) coincided with the country's zenith during the 20th century, and rugby was important in building Wales' modern identity. There is a long tradition of Welsh supporters singing before and during matches. The choral tradition developed in Wales during the 19th century alongside the rise of nonconformity, and has extended to singing at rugby matches. Commonly sung songs include the hymn Bread of Heaven, Tom Jones' Delilah, and Max Boyce's Hymns and Arias. Wales' first home international was played at St Helen's ground, Swansea in 1882. In the 1880s and 1890s, home Welsh internationals were played at Cardiff, Swansea, Newport and Llanelli. Swansea continued to be used as an international venue until 1954, when Cardiff Arms Park became Wales' primary home venue. Cardiff Arms Park first had a stand erected in 1881, and continued to expand its seating that decade. Crowds continued to grow and in 1902 in Wales' match against Scotland a world record 40,000 spectators paid to see the match. In 1911, the owners of the Arms Park, the Marquess of Bute's family, confirmed Wales' tenure and the 1920s and 1930s, Wales gradually gained increasing control. A new stand was built at the park in the 1933–34 season, which increased the grounds capacity to 56,000. By 1958, the WRU had concluded that a new national ground was needed due to flooding that often plagued Arms Park. 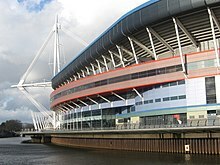 After debate and disputes between the WRU and various other parties, including Cardiff RFC, in the 1960s, it was decided that a new national stadium would be built with a new ground for the Cardiff club backing onto it. The National Stadium, as it was known, was officially opened in 1970. Currently, Wales play all their home matches at the 74,500 capacity Millennium Stadium, Cardiff, which is also Wales' national stadium. The Millennium Stadium was first conceived in 1994, when a group redevelopment committee was set up. It was decided to replace the National Stadium at Cardiff Arms Park after a review found it was out of date; new legislation also required stadia to be all-seated. Construction began in September 1997, and was completed by June 1999, in time for the Rugby World Cup. The construction cost the WRU £126 million, which was funded by private investment, £46 million of public funds from the National Lottery, the sale of debentures to supporters (which offered guaranteed tickets in exchange for an interest-free loan), and loans. While the new ground was being built, Wales used the old Wembley Stadium for their home matches – a deal reciprocated during construction of the new Wembley, when FA Cup finals were held at the Millennium Stadium. Wales compete annually in the Six Nations Championship, which is played against five other European nations: England, France, Ireland, Italy, and Scotland. The Six Nations started as the Home Nations Championship in 1883, as a contest between the four component nations of the United Kingdom. Wales first won it in 1893, when they achieved a Triple Crown. Wales have won the tournament outright 27 times, and shared 12 other victories. Their longest wait between championships was 11 years (1994–2005). Wales first won a Grand Slam in 1908 – although France did not officially join the Five Nations until 1910 – and their first Six Nations Grand Slam in 2005. Their most recent Grand Slam and Triple Crown were won in 2019 with victory over Ireland on the final day of the Six Nations tournament. The 1987 tournament was Wales' most successful; they won all three pool matches and their quarter-final, before losing to the All Blacks in the semi-finals. They then faced Australia in the third place play-off match, which they won 22–21. In the next two tournaments in 1991 and 1995, Wales failed to progress beyond the pool stage, winning just one match in each tournament. They also became the first co host nation to not make it out of the pool stage in 1991. Both the 1999 and 2003 tournaments were more successful, with Wales qualifying for the quarter-finals both times. Wales hosted the event in 1999 and topped their pool only to lose to eventual winners Australia in the quarter-finals. In 2003, they finished second in their pool behind the All Blacks, and faced England in their quarter-final. They lost to England, the eventual champions, 28–17. Wales conceded 17 penalties, and their lack of discipline proved costly. In the 2007 World Cup, Wales again failed to progress from the pool stage. After a loss to Australia, and two wins against Japan and Canada, they faced Fiji for a place in the quarter-finals. The game started poorly for Wales who were behind 25–3 at half-time. They fought back to lead by three points with six minutes remaining, but Fiji then scored a try to win 38–34 and eliminated Wales from the tournament. At the 2011 World Cup, Wales reached the semi-finals for the first time since 1987. Playing the semi-finals against France, Wales lost 9–8, in a game overshadowed by the 18th-minute sending off of Wales' captain Sam Warburton for a dangerous tackle against Vincent Clerc. When the World Rugby Rankings were introduced in October 2003, Wales were ranked 8th. [h] They rose to 7th in June 2004, before falling back to 8th in November that year. Following a Grand Slam win in the 2005 Six Nations, they rose to a ranking position of 5th. They fell to 9th by June 2006, and, after rising back to 8th by September, fell to 10th after the 2007 World Cup. A second Six Nations' Grand Slam in 2008 propelled them to 6th in the rankings, but following losses to South Africa in the mid-year and end-of-year internationals Wales slipped to 7th. Wales climbed to 4th after a win over Scotland in their first match of the 2009 Six Nations. They slumped to 9th in 2010 but rose back to 4th after their fourth place in the 2011 World Cup. Since then – notwithstanding a nine-game slump in 2012–13 where they fell to 9th – Wales have ranked consistently in the top six teams. They reached their highest ranking of 2nd during the 2015 Rugby World Cup, and are currently ranked 2nd as of 18 March 2019. Wales have won 379 (or 52.49%) of their 722 Test matches. Their biggest Test defeat was a 96–13 loss to South Africa in 1998, and their largest victory was a 98–0 defeat of Japan in 2004. Their record for most tries in a match is 16, scored against Portugal in 1994 – they also scored 102 points in this match, more than in any other Test. Wales' record for consecutive Test wins is 14 (ongoing), and for consecutive losses is 10. On 15 January, head coach Warren Gatland named a 39-man squad for the 2019 Six Nations Championship. On 13 February, Scott Williams was released from the squad due to injury. On 26 February, Cory Hill was released from the squad due to injury. ‡ – Denotes dual contracted players. The WRU contacts some players under "dual contracts" that are 60% funded by the national union, and 40% by the player's regional side. The contracts restrict the number of domestic matches the player can play each season while guaranteeing their availability for Wales. The number of caps relates to the number of caps won upon signing first National dual contract. Ten former Welsh internationals have been inducted into the International Rugby Hall of Fame, while 18 have been inducted into the World Rugby Hall of Fame. One Welsh player, Shane Williams in 2008, has been awarded World Rugby Player of the Year (formerly known as the International Rugby Board Player of the Year). Neil Jenkins was the first rugby player to surpass 1000 Test points. He holds several Welsh records, including the most points scored for Wales with 1049, the most successful penalty kicks for Wales with 248, and the Welsh record for most points in a single Test match with 30. The record for drop-goals for Wales is held by Jonathan Davies with 13. Shane Williams is Wales' record try-scorer with 58 tries. Williams is also Wales' record try-scorer in Six Nations Championships with 22 and the Rugby World Cups with 10. Colin Charvis' 22 tries is the all-time Welsh record for a forward, and was the world record for tries by a forward until 2011. Gethin Jenkins is the nation's most capped player with 129 Welsh caps. Four other players have earned 100 caps or more: Alun Wyn Jones, Stephen Jones, Gareth Thomas and Martyn Williams. The record for most Tests as captain is held by Sam Warburton with 49. The record for the most consecutive appearances is held by Gareth Edwards who played all 53 of his Tests for Wales consecutively between 1967 and 1978. Edwards is also Wales' youngest ever captain at the age of 20. The youngest player ever capped for Wales is Tom Prydie, who made his debut in Wales' 2010 Six Nations finale against Italy at age 18 years, 25 days, beating the record set by Norman Biggs in 1888. Prydie is also Wales' youngest try-scorer, scored against South Africa in June 2010, overtaking the record that Tom Pearson set on his debut in 1891. Winger George North, aged 18 years 214 days, overtook Pearson's record as the youngest Wales player to score a try on debut in November 2010. Following the unsuccessful tour to South Africa in 1964, the WRU set up a working party on coaching. The party recommended that Welsh clubs accept the principle of coaching. David Nash was appointed as the national team's first coach in 1967, but for the 1968 tour of Argentina, the WRU initially planned not to have a coach tour with the team. Following pressure from the Welsh clubs at the WRU's annual general meeting, the decision was reversed and Clive Rowlands was appointed as coach for the tour. The appointing of a coach for the team coincided with Wales' success in the Five Nations during the 1970s. ^ Wales was the 28th match of New Zealand's tour, and at that point the tourists had scored 801 points and conceded only 22. ^ Wales defeated France in 1908 and 1909 to win Grand Slams in those seasons also even though France did not join the Championship until 1910. ^ France was readmitted into international rugby union following the Home Nations Championship in 1939; France had been expelled in 1931. ^ This is victory over England, Ireland, Scotland and Wales all on the same tour. ^ For more information see Introduction of regional rugby union teams in Wales. ^ For the Rugby World Cup the jersey is not allowed any sponsors on it – only the national union's emblem, the Rugby World Cup logo, and the logo of the jersey's manufacturer. ^ Ranking archives can be found at the World Rugby website. ^ Sheers (2013), p. 1984. ^ a b "A Brief History of the Welsh Rugby Union". Welsh Rugby Union. Retrieved 18 September 2007. ^ "Wales' Grand Slam History". Welsh Rugby Union. 21 March 2005. Archived from the original on 3 July 2007. Retrieved 18 March 2008. ^ a b c "History". Six Nations Rugby Ltd. Retrieved 30 November 2014. ^ "RBS 6 Nations Fixtures & Results: 1882–1883". Six Nations Rugby. Retrieved 1 December 2014. ^ a b "6 Nations History". rugbyfootballhistory.com. Retrieved 12 August 2007. ^ a b c "Six Nations History". 6-nations-rugby.com. Archived from the original on 17 June 2008. Retrieved 15 June 2008. ^ Andrews (1991), p. 343. ^ a b c d e f g h i j k "Six Nations Championship: Past Winners". ESPN. Retrieved 1 December 2014. ^ Elliott (2012), pp. 177–178. ^ a b McCarthy (1968), p. 46. ^ "The 1905/06 'Originals'". rugbymuseum.co.nz. Archived from the original on 26 March 2013. Retrieved 12 August 2007. ^ McCarthy (1968), pp. 48–49. ^ Elliott (2012), p. 198. ^ Parry-Jones (1999), p. 180. ^ Davies, Sean (28 September 2006). "Mighty Boks: South African rugby". BBC Sport. Retrieved 12 August 2007. ^ "Rugby Football". The Free Lance. Wellington. 12 January 1907. Retrieved 30 November 2014. ^ a b Davies, Sean (22 September 2005). "Wallaby wonders: Aussie rugby". BBC Sport. Retrieved 12 August 2007. ^ Smith (1980), p. 198. ^ a b Smith (1980), p. 204. ^ Richards (2006), p. 123. ^ Richards (2006), p. 124. ^ Richards (2006), p. 126. ^ Smith (1980), p. 262. ^ Richards, Huw (24 February 2010). "Wooller inspires British Army triumph". ESPN. Retrieved 1 December 2014. ^ Richards (2006), p. 46. ^ McLean (1969), p. 147. ^ Potter (1961), p. 99. ^ Smith (1980), p. 344. ^ McCarthy (1968), p. 233. ^ Smith (1980), p. 349. ^ Smith (1980), p. 368. ^ "World Rugby 1951 – Date". England Rugby. Archived from the original on 23 June 2015. Retrieved 23 June 2014. ^ Smith (1980), p. 369. ^ a b Morgan & Fleming (2003), pp. 44–45. ^ Smith (1980), p. 389. ^ Smith (1980), p. 393. ^ a b c Rees, Paul (17 March 2012). "Wales grand slam can herald start of new golden age". The Guardian. Archived from the original on 2 July 2015. Retrieved 2 July 2015. ^ a b c d Richards, Huw (26 February 2015). "The greatest Welsh player of them all bows out". ESPN. Archived from the original on 11 August 2015. Retrieved 11 August 2015. ^ a b "Gareth Edwards". ESPN. Retrieved 2 February 2013. ^ McLean (1969), p. 144. ^ McLean (1969), p. 119. ^ Smith (1980), p. 400. ^ "Grand Slam 1971". Welsh Rugby Union. Archived from the original on 27 June 2015. Retrieved 11 August 2015. ^ "Six Nations: Golden moments". BBC Sport. 24 January 2003. Retrieved 18 September 2007. ^ "The greatest conversion since St. Paul". ESPN. Archived from the original on 11 August 2015. Retrieved 11 August 2015. ^ "1971 Australia & New Zealand". British Lions Ltd. Retrieved 30 November 2014. ^ "Sport in chaos as crisis deepens". BBC Sport. 27 February 2001. Retrieved 20 September 2007. ^ Smith (1980), p. 432. ^ "Gran Slam 1976". Welsh Rugby Union. Archived from the original on 26 September 2012. Retrieved 11 August 2015. ^ "RBS Six Nations: 11 Grand Slams: Grand Slam 1978". Welsh Rugby Union. Archived from the original on 27 June 2015. Retrieved 11 August 2015. ^ "180th All Black Test: 741st All Black Game". allblacks.com. Retrieved 21 September 2007. ^ "Andy Haden has no regrets over line-out 'dive' against Wales". BBC Sport. 24 November 2012. Retrieved 2 July 2015. ^ a b Godwin, Hugh (18 October 1998). "Haden 'dived' to cheat the Welsh". The Independent. Retrieved 2 July 2015. ^ "Roger Quittenton". ESPN. Retrieved 2 July 2015. ^ a b "Andy Haden dives to save rugby test". Ministry for Culture and Heritage. 17 November 2014. Retrieved 2 July 2015. ^ a b Davies, Sean (13 November 2004). "All Black magic: New Zealand rugby". BBC Sport. Retrieved 25 September 2007. ^ "191st All Black Test: 792nd All Black Game". allblacks.com. Retrieved 25 September 2007. ^ a b "1980s: v Wales". ESPN. Retrieved 11 August 2015. ^ Davies, Sean (12 February 2007). "Eastern Promise: Japanese rugby". BBC Sport. Retrieved 18 September 2007. ^ Peatey (2011), p. 36. ^ Peatey (2011), p. 39. ^ a b Peatey (2011), pp. 246–247. ^ Pye, Steven (20 March 2013). "Remembering England's woe in Cardiff in the 1989 Five Nations". The Guardian. Archived from the original on 20 January 2014. Retrieved 11 August 2015. ^ "Wooden Spoon History". Welsh Rugby Union. 28 March 2003. Archived from the original on 2 June 2013. Retrieved 11 August 2015. ^ Peatey (2011), p. 62. ^ a b c Peatey (2011), pp. 264–265. ^ "1990s: v Wales". ESPN. Archived from the original on 6 March 2016. Retrieved 13 August 2015. ^ Peatey (2011), p. 81. ^ a b Peatey (2011), pp. 282–283. ^ Glover, Tim (10 January 1999). "Re-enter the Dragon; interview – Kevin Bowring". The Independent. Retrieved 2 December 2014. ^ a b c "Graham Henry". Welsh Rugby Union. Retrieved 1 December 2014. ^ a b c Richards, Huw (12 March 2015). "Graham Henry's downfall as Wales coach". ESPN. Archived from the original on 14 August 2015. Retrieved 14 August 2015. ^ "Henry the "Great Redeemer"". tvnz.co.nz. 6 July 2005. Archived from the original on 15 October 2007. Retrieved 27 September 2007. ^ a b Peatey (2011), p. 115. ^ Jenkins, Tom (2 February 2013). "Bridgend and Maesteg's malaise symbolic of the decline of Welsh club rugby". The Guardian. Retrieved 15 August 2015. ^ "Damning report questions survival of Welsh rugby regions". BBC Sport. 7 November 2012. Retrieved 15 August 2015. ^ a b Peatey (2011), pp. 323–324. ^ a b Peatey (2011), p. 160. ^ Pyke, Chris (24 January 2014). "Where the 2005 Grand Slam winners are now". walesonline.co.uk. Retrieved 7 July 2015. ^ Palmer, Bryn (21 March 2005). "Wonderful Wales exude joy of Six". BBC Sport. Retrieved 27 September 2007. ^ "All Blacks step up a Gear to crush Wales". Australian Broadcasting Corporation. 6 November 2005. Retrieved 27 September 2007. ^ "Ruddock steps down as Wales coach". BBC Sport. 14 February 2006. ^ "Wales unveil Jenkins as new coach". BBC Sport. 27 April 2006. Retrieved 27 September 2007. ^ a b Peatey (2011), pp. 186–187. ^ a b Peatey (2011), p. 188. ^ "Lewis explains Jenkins' sacking". BBC Sport. 5 October 2007. Retrieved 3 November 2007. ^ "Gatland unveiled as Wales coach". BBC Sport. 8 November 2007. Retrieved 8 November 2007. ^ "Wales prove they're Grand masters". Wales On Sunday. 16 March 2008. Archived from the original on 22 February 2014. Retrieved 2 May 2008. ^ Corrigan, James (29 November 2014). "Wales 12 South Africa 6: Warren Gatland's men beat southern hemisphere team for first time in 23 games". The Telegraph. Retrieved 11 August 2015. ^ a b "Wales 8–9 France". BBC Sport. 15 October 2011. Retrieved 4 April 2012. ^ "Wales 16–9 France". The Guardian. 17 March 2012. Retrieved 4 April 2012. ^ Rees, Paul (10 February 2013). "Six Nations 2013: Wales win after George North turns screw on France". The Guardian. Retrieved 11 August 2015. ^ "Wales bask in Six Nations title after slamming England in Cardiff rout". The Guardian. 16 March 2013. ^ Williams, Richard (17 October 2015). "Rugby World Cup 2015: South Africa 23–19 Wales". BBC Sport. Retrieved 18 October 2015. ^ Andrews (1991), p. 346. ^ "Welsh rugby union strips talent from England – Cotton Traders". The Independent. UK. 6 December 1991. p. 32. ^ Howell, Andy (13 June 2015). "Wales set to unveil a black kit to be worn at the 2015 Rugby World Cup". walesonline.co.uk. Retrieved 21 September 2015. ^ a b "Wales Out of Red and into Black". Welsh Rugby Union. 11 October 2005. Archived from the original on 21 February 2009. Retrieved 15 June 2008. ^ "Under Armour – Official Technical Partner". Welsh Rugby Union. Retrieved 30 November 2014. ^ Rimmer, Simon (19 November 2013). "Player 'Selfies' Reveal New Change Kit". Welsh Rugby Union. Retrieved 4 February 2013. ^ "NZRU not approached about 2015 World Cup ad". stuff.co.nz. 2 September 2014. ^ "WRU extends Reebok deal". BBC Sport (British Broadcasting Corporation). 23 March 2004. Retrieved 2 August 2015. ^ "New kit deal for Wales". BBC Sport (British Broadcasting Corporation). 5 November 2000. Retrieved 2 August 2015. ^ "New name for Welsh shirts". BBC Sport (British Broadcasting Corporation). 21 August 2002. Retrieved 2 August 2015. ^ "WRU signs £10m deal for new kit". BBC News (British Broadcasting Corporation). 14 February 2008. Retrieved 2 August 2015. ^ "Insurance firm Admiral is new sponsor of Welsh rugby". BBC News (British Broadcasting Corporation). 20 March 2010. Retrieved 2 August 2015. ^ "Wales pick-up historic Isuzu shirt deal". WRU (Welsh Rugby Union). 26 June 2017. Retrieved 24 October 2017. ^ Andrews (1991), p. 336. ^ Andrews (1991), p. 337. ^ Morgan (2005), p. 434. ^ a b Howell, David R. (16 April 2014). "Heritage Songs: The Decline of a Cultural Tradition". Nomos Journal. Retrieved 30 June 2015. ^ Schofield, Daniel (10 December 2014). "Welsh rugby chiefs urged to ban Tom Jones' 'Delilah' before matches at Millennium Stadium". The Independent. Retrieved 30 June 2015. ^ "England prepare for Cardiff with 'Hymns and Arias' rung out during training". Irish Times. 4 February 2015. Retrieved 30 June 2015. ^ "Liberty Stadium – The Background". liberty-stadium.com. Archived from the original on 3 August 2007. Retrieved 24 August 2007. ^ Smith (1980), p. 114. ^ Smith (1980), p. 9. ^ Smith (1980), p. 139. ^ Smith (1980), p. 175. ^ Smith (1980), p. 219. ^ Smith (1980), p. 284. ^ Smith (1980), p. 371. ^ Smith (1980), p. 372. ^ Smith (1980), p. 373. ^ Hale, Matt (30 July 2004). "The Venue: The Millennium Stadium". TheFA.com. Archived from the original on 5 April 2005. Retrieved 18 February 2008. ^ "Background to the Millennium Stadium Project". millenniumstadium.com. Archived from the original on 9 October 2007. Retrieved 10 November 2007. ^ "Why is it taking so long?". Bristol Evening Post. 28 May 2007. p. 8. ^ "Wembley Stadium". ESPN. Retrieved 30 June 2015. ^ "The Millennium Years". The Football Association. Retrieved 30 June 2015. ^ "Championships & Titles". Welsh Rugby Union. Retrieved 30 November 2014. ^ "2005 Grand Slam". Welsh Rugby Union. Retrieved 30 November 2014. ^ Peatey (2011), pp. 300–301. ^ a b "World Rugby Rankings". World Rugby. Retrieved 30 November 2014. ^ "Wales move up to second in world rankings after victory at Twickenham". The Guardian. Retrieved 20 October 2015. ^ "Statsguru – Test matches". ESPN. Retrieved 13 April 2019. ^ a b "Wales Stats: Country by Country Breakdown". Welsh Rugby Union. Retrieved 30 June 2015. ^ Broadley, Luke (18 March 2015). "Four new national dual contracts". Welsh Rugby Union. Retrieved 13 August 2015. ^ Thomas, Simon (18 March 2015). "Wales warriors Alun Wyn Jones and Dan Biggar sign dual contracts to give Warren Gatland huge boost". WalesOnline. Retrieved 30 June 2015. ^ Thomas, Simon (24 March 2015). "Wales rugby National Dual Contract details revealed: The full story on the games our top stars can play". WalesOnline. Retrieved 30 June 2015. ^ "Wales: Dan Lydiate joins Ospreys on a national dual contract". BBC Sport. 9 December 2014. Retrieved 30 December 2015. ^ a b c "Quartet re-sign National Dual Contracts". Welsh Rugby Union. 28 October 2016. Retrieved 8 November 2016. ^ "Wales dual contracts for NG Dragons pair and Scarlets prop". BBC Sport. 26 December 2014. Retrieved 30 December 2015. ^ "Jake Ball: Wales and Scarlets second row signs dual contract". BBC Sport. 2 January 2015. Retrieved 30 December 2015. ^ a b "Trio sign national dual contracts with Scarlets and WRU". ESPN. 13 February 2018. Retrieved 10 March 2018. ^ "Wales and Scarlets' prop Samson Lee signs national dual contract". BBC Sport. 11 January 2015. Retrieved 30 December 2015. ^ a b "Four New National Dual Contracts". Welsh Rugby Union. 18 March 2015. Retrieved 18 March 2015. ^ "AWJ commits to Wales and Ospreys". Ospreys. 16 March 2018. Retrieved 16 March 2018. ^ "Anscombe Signs New NDC". Welsh Rugby Union. 12 May 2017. Retrieved 12 May 2017. ^ "Baldwin and King Sign NDCS". Welsh Rugby Union. 5 November 2015. Retrieved 30 December 2015. ^ "Davies returns to Wales on NDC". Welsh Rugby Union. 16 May 2016. Retrieved 8 November 2016. ^ "Halfpenny signs National Dual Contract". Welsh Rugby Union. 3 August 2017. Retrieved 4 August 2017. ^ "George North signs for Ospreys". Welsh Rugby Union. 25 April 2018. Retrieved 25 April 2018. ^ "The International Rugby Hall of Fame". The International Rugby Hall of Fame. Archived from the original on 22 June 2013. Retrieved 30 November 2014. ^ "IRB Hall of Fame welcomes 15 new inductees". World Rugby. 18 November 2014. Retrieved 30 November 2014. ^ "World Rugby Awards Past Winners". World Rugby. 2014. Retrieved 23 June 2015. ^ a b "International Individual Records". superrugby.co.za. 13 August 2007. Archived from the original on 14 May 2008. Retrieved 15 June 2008. ^ "Neil Jenkins". ESPN. Retrieved 4 February 2013. ^ "Statsguru / Test matches / Player records". ESPN. Archived from the original on 22 October 2013. Retrieved 4 February 2014. ^ Richards, Huw (5 June 2012). "The little winger who left a big impression". ESPN. Retrieved 4 February 2013. ^ "Colin Charvis". ESPN. Retrieved 4 February 2013. ^ "Wales Records & Milestones: Welsh Centurions". Welsh Rugby Union. Retrieved 16 March 2014. ^ "Wales Captains: 1881–Present". Welsh Rugby Union. Retrieved 4 February 2013. ^ Sportsbeat (20 March 2010). "Hook crosses twice in Wales romp over Italy". Six Nations Rugby Ltd. Archived from the original on 15 December 2013. Retrieved 22 March 2010. ^ James, Steve (20 March 2010). "Tom Prydie's record-breaking Wales debut made little sense". The Telegraph. Retrieved 4 February 2014. ^ Thomas, Simon (7 June 2010). "Pride as record Wales try for Tom Prydie". walesonline.co.uk. Retrieved 4 February 2010. ^ Richards, Huw (19 November 2010). "A record-breaking debut". ESPN. Retrieved 4 February 2014. ^ a b "Warren Gatland". Welsh Rugby Union. Retrieved 2 July 2015. ^ Morgan & Fleming (2003), p. 46. ^ "Wales' rugby coaches". BBC Sport. Retrieved 31 January 2014. ^ "Gareth Jenkins". Welsh Rugby Union. Retrieved 31 January 2014. ^ "Robin McBryde". Welsh Rugby Union. Retrieved 31 January 2014. ^ "Rob Howley". Welsh Rugby Union. Retrieved 31 January 2014. Wikimedia Commons has media related to Wales national rugby union team.